📊 Where can I access to the performance of my campaigns? You can find the detailed performance of all your campaigns in the "Reports" tab. Here you can find analytics around: Reviews, Marketing, Operational and Traffic (only if you have an Instagram Story offer). You can export these data points into Excel if you click on the "Export" icon. You can also share the report page via URL by clicking on the "Share" icon. 📊 What do the main metrics on the Reports tab mean (EMV, interactions, engagement rate)? 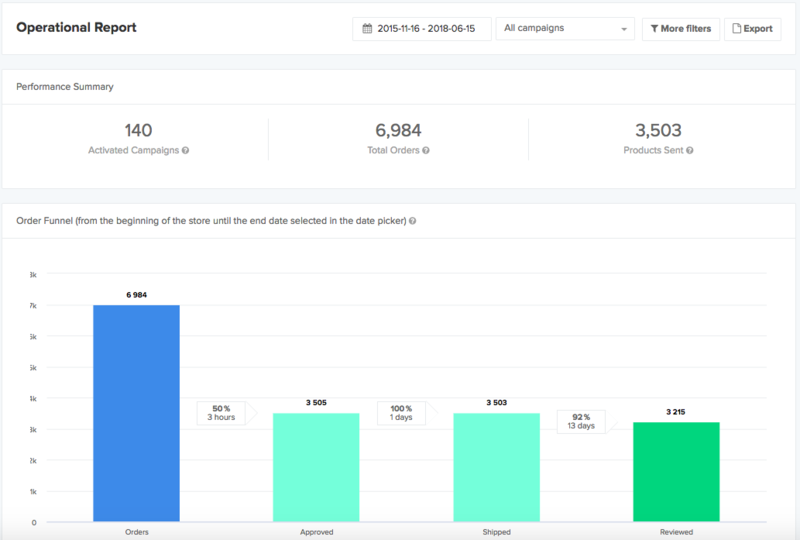 The report tab is here to help you analyze your campaigns' performance via multiple data that we monitor and compute for you. Below is a list of the main data points we track. If you'd like more details on each indicator, don't hesitate to go through the data available in the "Reports" tab. The total number of likes on Instagram and the total number of views on Youtube. 📊 How to customize the Reports tab? You can filter the "Reports" tab according to the date and campaigns, as well as products and platform (Instagram, InstaStories, or Youtube) under the "More filters" button. When you change filters, all the four sectors of the "Reports" tab will show data according to those filters. 📊 What are the analytics represented in the Reviews section? In this section, you can find all the reviews posted on your products by your previously selected influencers. If you want more details on the data in this section, please refer to the article "What do the main metrics in the Reports tab mean?" 📊 What are the analytics represented in the Marketing section? 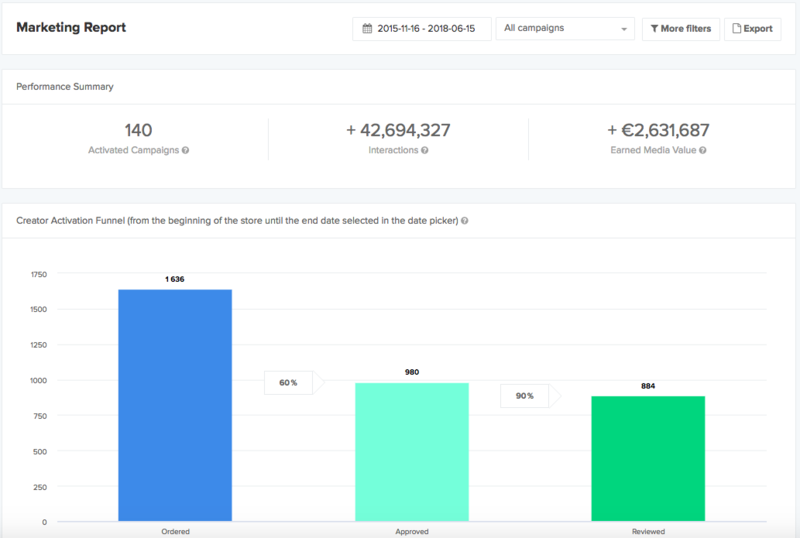 In this section, you can find data related to your campaign performance, such as number of campaigns, number of interactions, earned media value, creator activation funnel, review publication graph, campaign and creator ranking among others. The creator activation funnel shows the number of influencers that placed at least one request on your product (not counting if a given influencer did several requests) whereas the orders funnel in the "Operations" section shows the total number of requests (counting if a given influencer did several requests). 📊 What are the analytics represented in the Operational section? In this section, you can find analytics concerning logistics. Here you can find the number of orders, the number of sent products, your stores activity and orders status evolution. average response time, which is the time you take on average to answer a request. To optimize your request management and to give an optimal image of your brand to the influencers, we recommend you to keep your acceptance rate above 80% and your average response time within 48 hours. You can also find these two data points in the "Requests" tab. 📊 What are the analytics represented in the Trafic section? In this section, you can find information concerning the trafic related to the clicks generated from the reviews posted by your influencers. 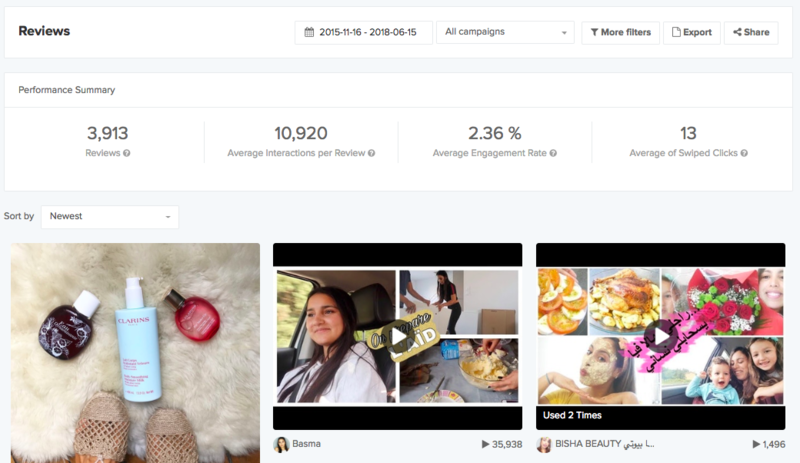 Thanks to the link of the product posted on YouTube reviews or on Instagram Stories, we can track the number of clicks generated by the influencer's audience. That is why it's really important for you as a brand to fill in the product link section when you create your product page. For more information on this topic check the article "Why is it important to fill in the product link when I create a product on Octoly?"